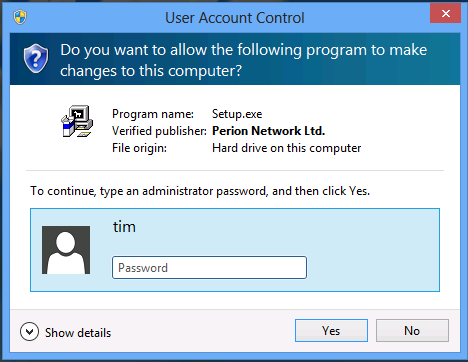 “Users of today’s PCs live on a precipice. 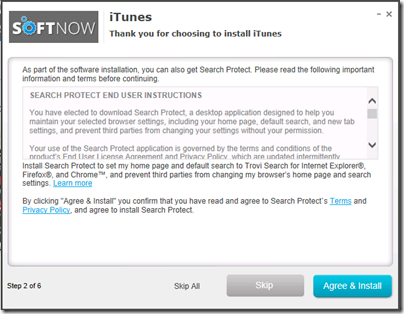 One false click and the adware and malware invades,” I remarked in a recent comment on Microsoft’s Surface Pro 3 launch. The remark was prompted by a recent call from a friend. His PC was playing up. He was getting all sort of security warnings and being prompted to download more and more apps supposedly to fix problems. 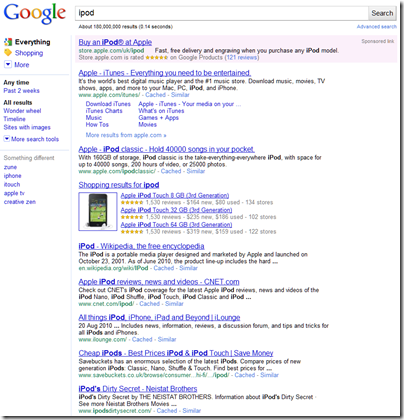 It all started, he said, when he went to Google to install iTunes. After the clean-up, I wondered what had happened. 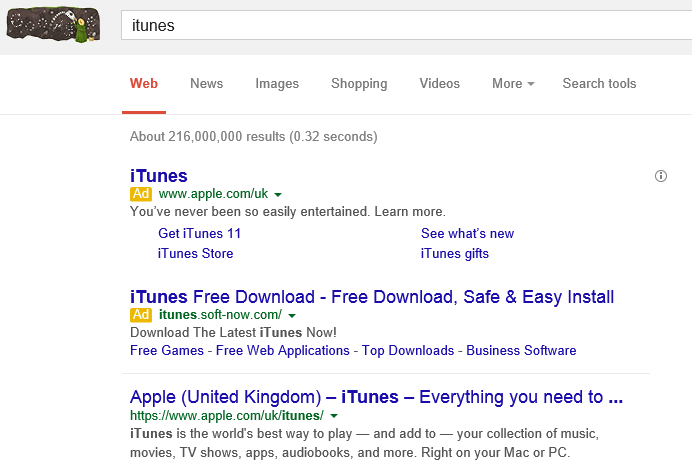 I went to Google and typed in iTunes. 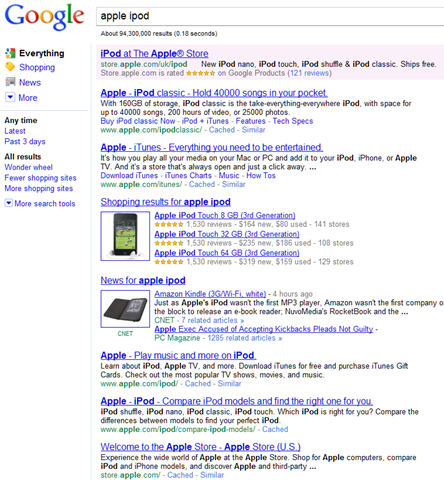 The top hit is Apple, which perhaps to prevent this kind of problem has actually paid for an ad on its own brand name. 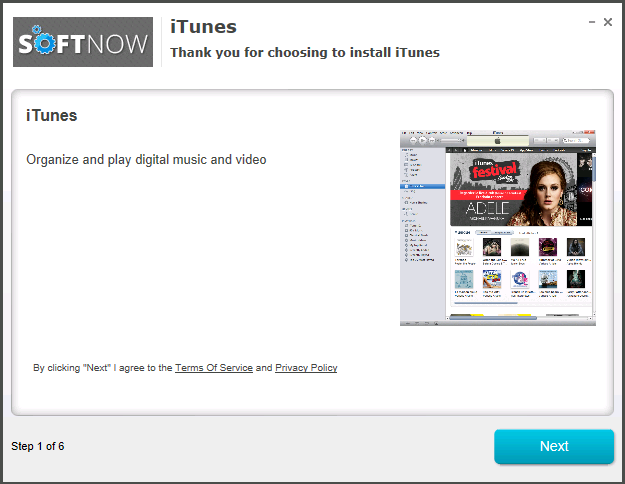 However my friend, understandably, went for the link that said iTunes Free Download (actually I am not sure if this was the exact link he clicked, but it was one like it). 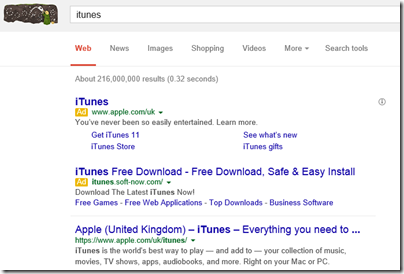 Note how the ads are distinguished from the organic hits only by a small yellow indicator. Using a secure virtual machine, I investigated what happens if you click one of these links (I advise you NOT to try this on your normal PC). I clicked the Google one, which took me to SOFTNOW. I hit the big Download button. 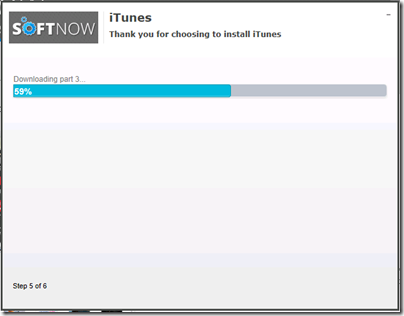 It is downloading a setup from drive-files-b.com which claims to be iTunes, but it is not, as we will see. The file passes Microsoft’s security scan and runs. 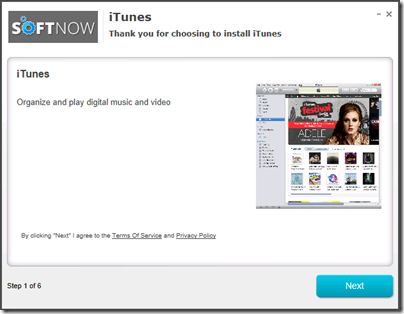 The setup is signed by Perion Network Ltd.
Now here comes iTunes – or does it? 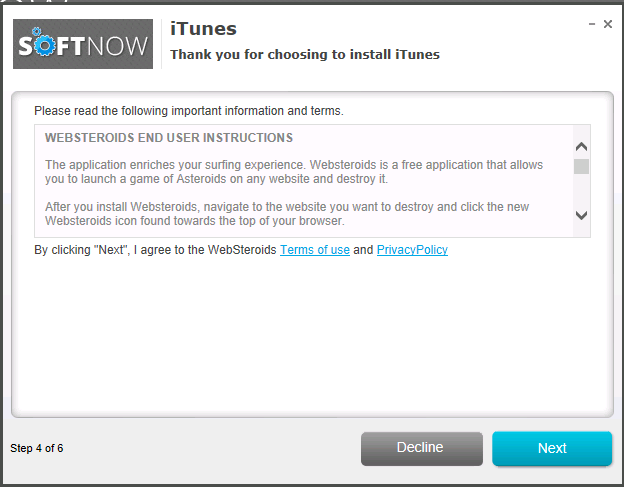 I clicked to see the Terms of Service. These are from Perion, not Apple, and explain that I am going to get an alternative search service for my browser plus other utilities, on an opt-out basis. However I doubt my friend clicked to see these. Probably he hit Next. 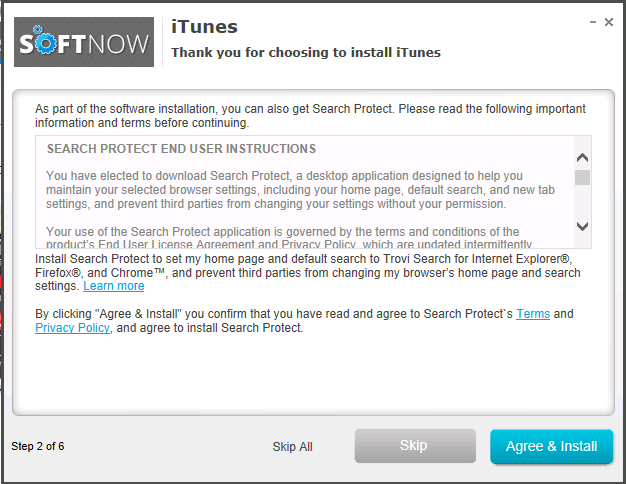 Apparently I have “elected to download Search Protect”. There are more terms to agree. The Skip and Skip All buttons are in grey; in fact, the Skip button looks disabled though perhaps it is not. 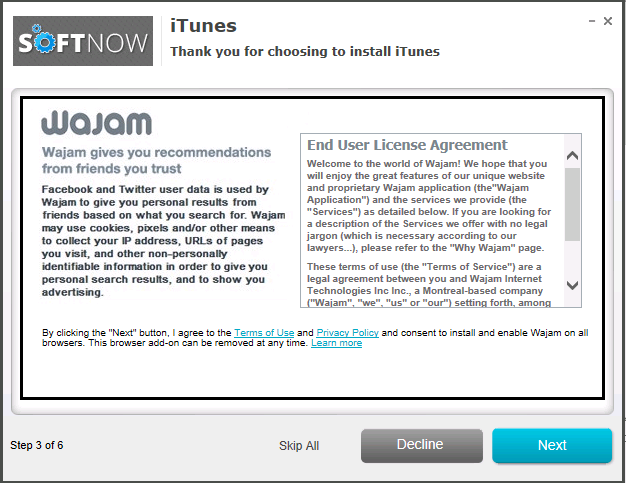 Now here comes a thing called Wajam which is going to recommend stuff to me. I am going to get “display ads (banner ads), text ads, in-text ads, interstitial ads, pop up ads, pop under ads, or other types of ads. 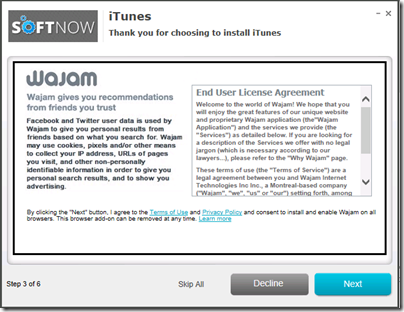 Users may see additional ads when using their internet browser or other software”. 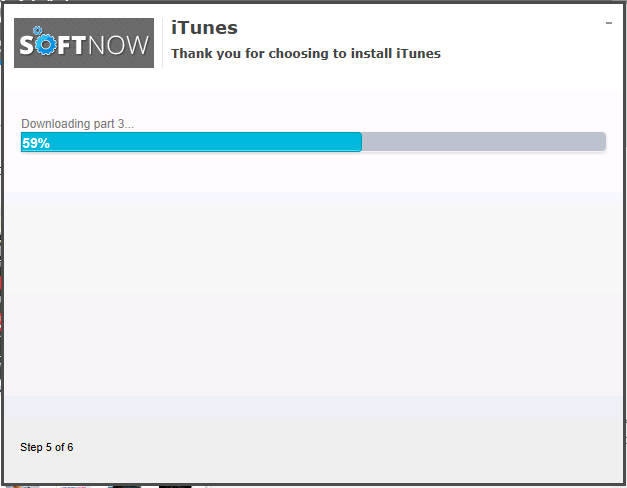 Now “iTunes” seems to be downloading. 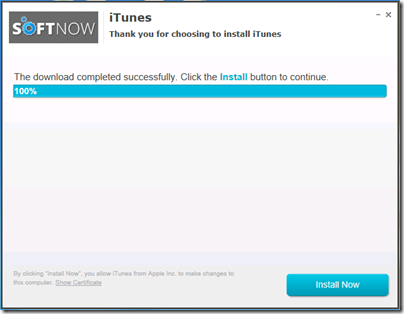 Once it downloads, I get an Install Now button. 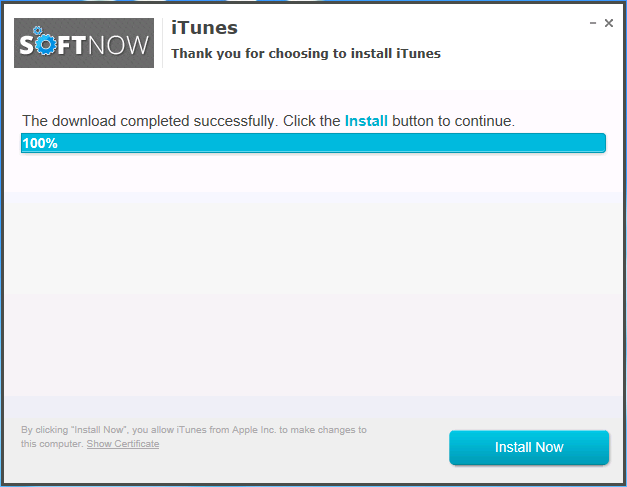 Apparently all those Next buttons I clicked did not install iTunes after all. 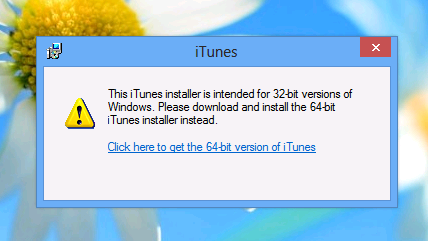 This last button, of course, downloads the real setup from Apple and runs it. Unfortunately it is the wrong version. Who is to blame for all this? Well, the warning signs may be obvious to those of us in the trade, but frankly it is not that unreasonable to go to your trusted search engine, type in iTunes, and click the download link. 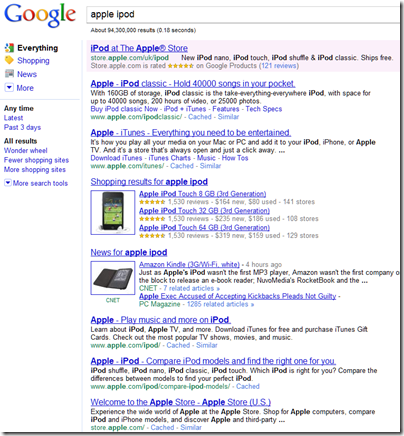 The blame is with Google (and Bing) for taking money from these advertisers whose aim is to get to you download their intrusive ad-laden extras. 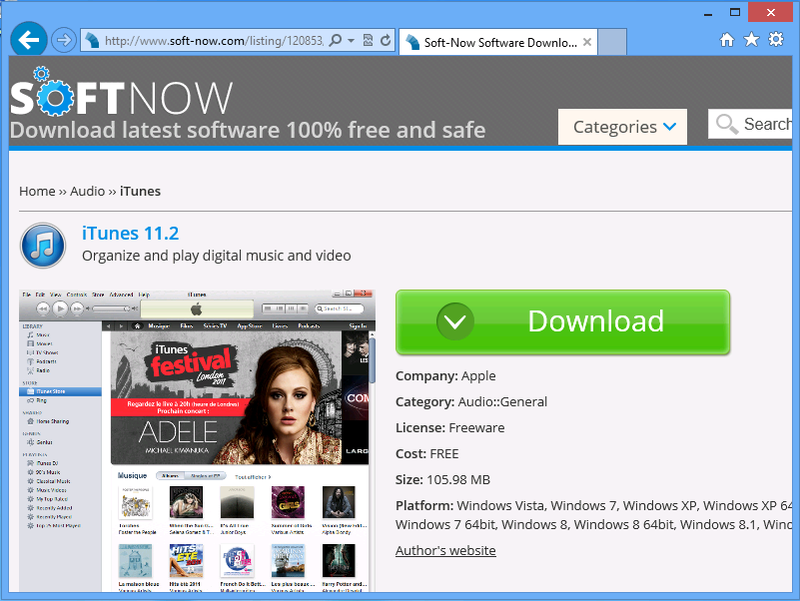 Apple iTunes is free software and you can get it from Apple here. Note that Google is experimenting with removing the address bar altogether, so you can only navigate the web by searching Google (which is what people do anyway). This would make users even more dependent on the search providers to do the right thing, which as you can see from the above, is not something you can count on. I have been playing with the Metro apps in Windows 8 Release Preview. It is only a small thing, but I am impressed with the ease with which you can customise the Bing News app to add your own special interests. See the video below for a quick demonstration. You will also see that I struggled to find out how to remove a custom section. This seems to be the way with Windows 8 in Metro: easy when you know how, but you have to figure it out. Microsoft has released its quarterly figures for January-March 2011. My at-a-glance summary is below. Business as usual? More or less, but there are a few points to note. The figure that jumps out is the stunning performance of Office, which includes SharePoint and Exchange. Why is everyone buying Office 2010, when a document like the one I am typing now could be done just as well in Word 2.0 from 1991, or more plausibly the free OpenOffice? The answer is the Microsoft has successfully transitioned many of its customers to using Office with SharePoint and Exchange, making it harder to stick with old versions and selling CALs (Client Access Licences) as well as the Office suite itself. This is highly profitable, though the aspect that puzzles me is that Office 365, which is cloud-hosted SharePoint and Exchange, is more cost-effective for the customer since it includes server software, CALs and in some cases the Office client for a commodity-priced subscription. In other words, I find it hard to see how Microsoft can remain equally profitable if a significant proportion of its customers switch to Office 365. The company may be depending on its ability to upsell those customers to further online services; or perhaps it has not fully thought this through and has set Office 365 pricing at what it needs to be in order to compete with Google. Fortunately for Microsoft, there is enough doubt concerning the safety of cloud services to sustain continued strong sales of on-premise solutions. Second notable thing: Windows is in decline. The reason: it is losing market share to Apple and to Google Android. Netbook sales are down 41% according to the release, and I would guess that those sales have mostly gone to Apple iPad and Android tablets rather than to Windows notebooks. Will Windows 8 reverse the decline? Speculation of course, but it will not repeat the success of Windows 7. In fact, my guess is that Windows 8 will be a hard sell to enterprises which have finally been persuaded to migrate from Windows XP. They are settling down for another five years of stability. Windows 7 was a consolidation release, just the sort of thing enterprises like. Windows 8 will be a revolution release, with most of the interest focused on what it can do in mobile and tablets. If it does succeed, it will do so slowly; there will be no rush to upgrade from 7 other than from the usual early adopters. 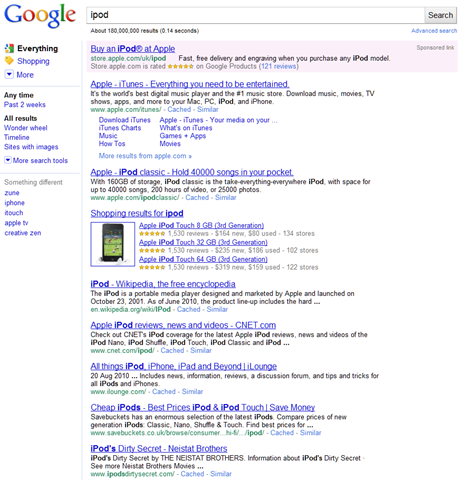 It may improve sales in the consumer market, but neither Mac nor iPad nor Android is going away. That leads on to mobile, the figures for which are buried under a pile of Xbox consoles. A good quarter for Xbox, though note how poor the margins are compared to those for Office or Windows. Finally, the online money drain continues. 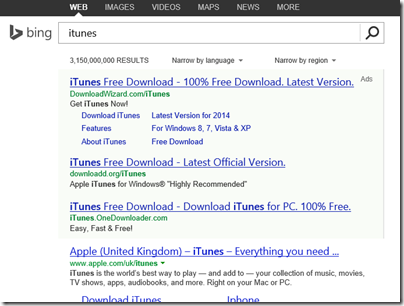 Note that this is Bing and online advertising, not Azure or Office 365. Microsoft must feel that it the strategic value of these online services is worth the cost, particularly since they tie into mobile and the ecosystem which Nokia is depending on for a reversal of its fortunes. Given that the company has money to burn, there may actually be some sense in that; though for a segment to make such large and consistent losses over a long period has to be a concern. Microsoft has appointed a new President of Server and Tools to replace Bob Muglia. 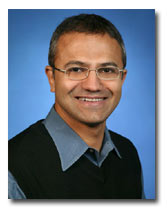 He is Satya Nadella, 43, and has been leading the Online Services Division, the bit in charge of Bing, MSN and adCenter. 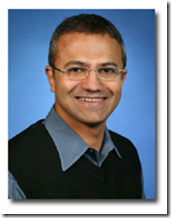 Before that, Nadella led Microsoft Business Solutions, focused on the Dynamics CRM application. I like to have my head in the clouds and feet on the ground (something I learned from Qi). I track Microsoft financials in a small way, and have observed that while Muglia’s Server and Tools has turned in stellar figures for several years, the Online Services Division by contrast has delivered large losses. 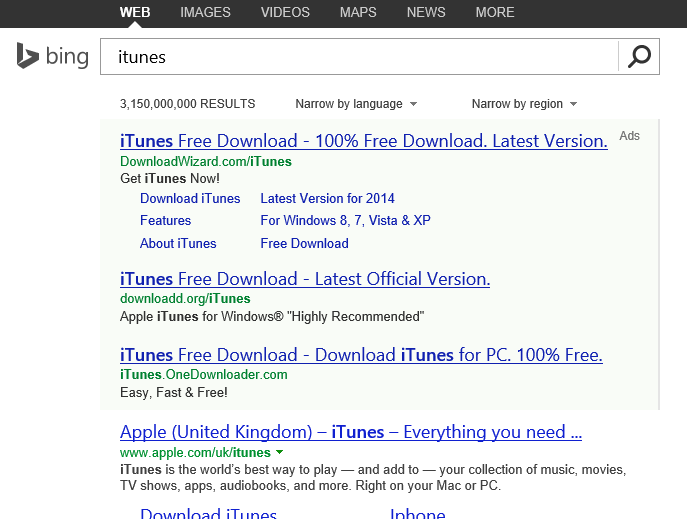 Then again, competing with Google in search is not easy, and Bing is perhaps doing as well as can be expected. CEO Steve Ballmer has also announced that Amitabh Srivastava, the well-regarded senior vice president in the Server and Tools Business is leaving Microsoft. Puzzling moves, which suggest to me significant strategy disagreements between Ballmer and the old Server and Tools leadership.